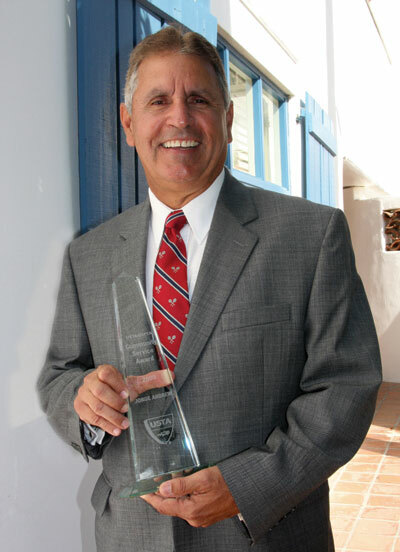 Jorge Andrew of Lexington, S.C., recently received the USTA/USPTA Community Service Award. Andrew is the director of tennis operations for the Lexington County Recreation and Aging Commission in Lexington, S.C.
Andrew was recognized during the USPTA’s annual awards breakfast at the USPTA World Conference on Tennis. The United State Professional Tennis Association, the world’s oldest and largest association of tennis-teaching professionals, hosted its annual World Conference Sept. 15-20 at La Quinta Resort and Club in La Quinta, Calif. The Community Service Award is a cooperative award presented annually by the United States Tennis Association as part of USPTA’s award program. Andrew has a strong commitment to bringing tennis to his community and helping to grow the game, which can be seen through his involvement with several tennis committees. He is currently the vice chairman of the USTA junior team tennis national committee, has served on the USTA Southern youth community tennis programs committee for the past four years and on the community tennis and adult competition committees for two years. He is in his second term as USTA South Carolina vice president and as a member of the hall of fame committee. He is also a USTA recreational coach workshop master trainer, a USPTA Master Professional, a QuickStart Tennis Play Format specialist and a USTA High Performance Coach. Andrew is the tournament director of the 2009 national public parks tennis championships. The Lexington County Recreation and Aging Commission owns and operates the Lexington County Tennis Complex, where Andrew serves as director of tennis operations, has 21 lighted courts and a 4,600-square-foot clubhouse. In addition, the commission is building a new state-of-the-art tennis complex with 24 lighted courts, four QuickStart Tennis Play Format tennis courts and a 10,000-square-foot clubhouse with a fitness room. The new facility will accommodate more tournaments, programs, leagues and new players. The United States Tennis Association is the national governing body for the sport of tennis in the United States. It owns and operates the U.S. Open, the largest annually attended sporting event in the world and recently launched the U.S. Open Series. In addition, it owns 94 Pro Circuit events throughout the United States, and selects the teams for the Davis Cup, Fed Cup, Olympic and Paralympic Games. A nonprofit organization with more than 700,000 members, it invests most of its proceeds to promote and develop the growth of tennis, from the grassroots to the professional levels. For more information on the USTA, log on to usta.com.